This Shark was made for a Natal Shark Rugby supporter. The Shark Cake went down very well at this fans Birthday Party as Western Province lost to the sharks that afternoon. 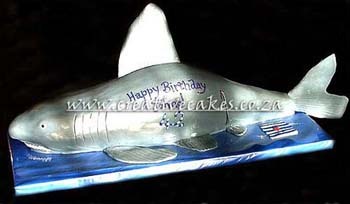 The shark supporters partied till the early hours and enjoyed their Shark Cake immensely. The Natal Rugby Union was formed in 1890. The KwaZulu-Natal Rugby Union and The Sharks are proud to be associated with, and to assist in the development of Rugby in KZN.